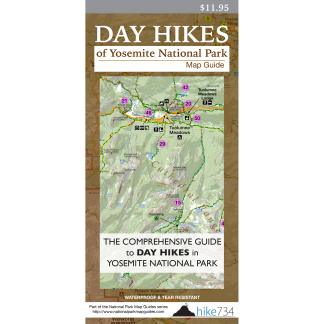 A beautiful walk up the Yosemite Creek drainage takes you to views looking at the north end of Yosemite before descending to this great collection of lakes. The trail steadily gains elevation leaving forest behind save for the few hardy trees growing up in the cracks between the granite. Views of the Yosemite Creek drainage are great with Mt. Hoffman peeking over the ridge, however the creek itself remains hidden far below. The trail levels out and traverses through the forest with scant views until it reaches Halfmoon Meadow. The wildflowers pop in this beautiful grassy meadow walled in by the ridges. The trail steeply zig-zags up a seemingly infinite amount of switchbacks to climb a quick 700ft/210m of elevation to a couple of lovely meadows and the junction with the Grant Lakes Trail. (see Grant Lakes for description which would add 2.5mi/4km and 400ft/120m elevation). Stay left to continue through the meadows to Ten Lakes Pass. As you crest the pass, a stunning panorama opens up with mountains stretching as far as the eye can see. 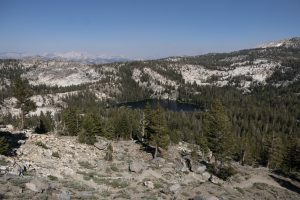 As you drop down on the other side of the pass through the granite landscape, huge plates of rock lay strewn and three of the lakes pop into view. The trail drops into the trees and skirts the south shore of the most popular lake. Head east where the main trail continues on the other side of the marshy inlet creek. After a brief stint in the meadows, it works its way up to additional views before turning into the forest and heading to one of the larger of the lakes with a quieter shoreline.